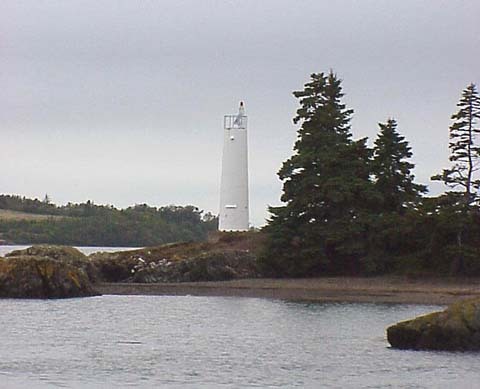 Deer Island Point Light sits at the southern point of Deer Island in the campground of Deer Island Point Park. The small lighthouse overlooks the Old Sow Whirlpool, which is the largest whirlpool in the western hemisphere. The whirlpool is at its peak during the new and full moons and can be seen three hours prior to high tide. The southern end of Deer Island is also where you can get a ferry back to Campobello Island. As we approached the campground my wife noted that there wasn't much time before the ferry left. I said I'd be quick. We saw the light tower (can't really called it a light"house"). It was rather disappointing. I snapped some photos, got back in the car, and... well... we missed the ferry. We had to wait another hour for the next ferry. Deer Point light wasn't worth missing the ferry. Oh well. From the northern point of the island at the ferry landing in Stuartwon, take route 772 south. Follow Route 772 through Nor-West Harbor. At the end of the road, take a left towards Leonardville. Go through Leonardville and Hibernia. You will come to a (fork?) in the road. Cummings Cove is to the right. Stay to the left, heading toward Deer Island Point. Just before the Ferry Landing is the entrance to the park on the right.